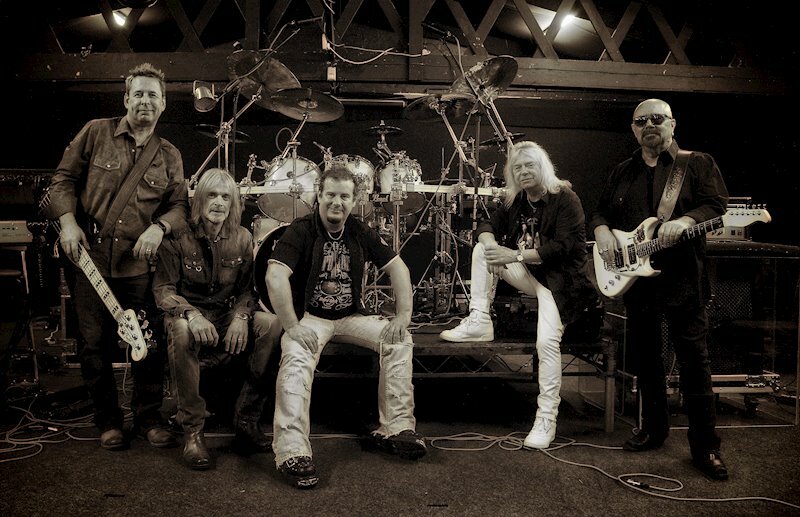 Formed in 1972, Magnum has undergone several changes in personnel over the years, however, the core of vocalist Bob Catley and guitarist/songwriter Tony Clarkin remain today. Their breakthrough album came in 1985 with On A Storyteller’s Night, which featured the single “Just Like An Arrow“. This success continued in the following years with the Roger Taylor-produced Vigilante in 1986, the top 5 album, Wings Of Heaven in 1988, and the Keith Olsen-produced Goodnight L.A., reaching No. 9 in the UK album charts in 1990. In the summer of 1995, Tony Clarkin announced the band were to split following a farewell tour of the UK and Europe. After Magnum split, a spin-off group featuring Catley and Clarkin was formed called Hard Rain, and they released the albums Hard Rain and When The Good Times Come. It was around this time that Catley launched a solo career using various songwriters, including Gary Hughes of the band Ten. However, Hard Rain found gigs and booking hard to come by, and there were discussions about renaming the band as Magnum. Eventually, Tony Clarkin and Catley re-launched Magnum with the album Breath Of Life in 2002 on SPV. So, what exactly are the unmistakable criteria of a typical Magnum song? First of all, of course, founder members’ Bob Catley’s charismatic vocals and guitarist Tony Clarkin’s melodic, relentlessly driving, rocking songwriting. In addition, the British band’s compositions all ooze a magic that’s difficult to describe, an enchanting ambience created by Clarkin’s poetic lyrics that create sonic images in their fans’ minds. No doubt about it: it’s the interplay of a number of different elements that have made Magnum one of the most charismatic British rock acts for more than forty years and have their music stand out to this day. Their latest album, Lost On The Road To Eternity, scheduled for release on Steamhammer/SPV on 19 January 2018, sees Magnum celebrate an impressive anniversary: it’s their 20th (!) studio recording and – without giving away too much at this stage – one of their most diverse and at the same time homogeneous offerings to date. 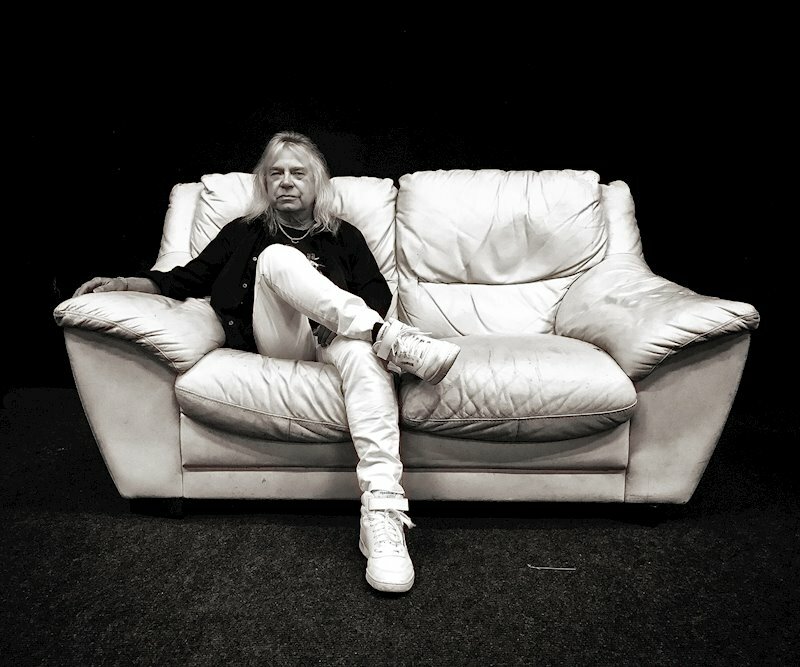 I was afforded the opportunity to grab one of the limited interview slots with Bob Catley himself recently. ANTIHERO: I just want to start, this is particularly special for me because growing up in Belfast, I first started going to rock gigs in the 80s, and it seemed that Magnum was one of the few bands that used to regularly play over there. Bob Catley: Oh yeah, that’s great. Brilliant, yeah. We did years ago, yeah. Then we stopped playing in Belfast, Dublin, or anywhere in Ireland. A couple years ago we went back there on the last tour and it’s been about 25 years since we played in Belfast at the Limelight Club. That was incredible, they made the club a lot bigger than we remembered, so that was great and great to be back. We try and keep coming back. Fortunately, we’re actually playing in Belfast again in … Where are we? We’re playing the Limelight again on the 1st of March when we kick off that tour in February and Belfast this March. I am looking forward to that. Yeah, it’s nice to be playing back in Belfast. Really nice people and they make us feel welcome. ANTIHERO: Back to those dark days for the country and was it a conscious effort to regularly play over there was that something the band made a decision about in the eighties. To be honest, not many bands were actually making the effort to come to Belfast. Bob Catley: Yeah, they were always good audiences, they’re great people. Yeah, we stopped playing there but we seem to be back with a promoter who cares about rock music in Belfast and trying to get bands back in there and thank God for that. It’s nice to have a promoter to welcome us back in Belfast. Looking forward to it, it’s great. More people should go to Belfast. I don’t know why they pick their own reasons, don’t they? Maybe they can’t afford the ferries. ANTIHERO: Yeah, that does seem to be an issue. Bob Catley: Yes. Money just comes into it, depends on who’s walking that way. Yeah, we need people to re-book us. That’s the biggest problem. Without that, you can’t just turn up and go, “Hello, we’re here. Does anybody want to hear some music?” Just go on the street corner, I guess. You need help from club promoters, so we’ve got a good relationship and we are looking forward to it. ANTIHERO: You’ve got another album. I’ve been fortunate enough to get a little bit of an advance preview of that. It’s going to pose some setlist problems because I would put it up there with Wings of Heaven, Storyteller’s Night as being a classic album. Which songs will you be playing from that album live? It seems like you can play it all. Bob Catley: Yeah. People say that. They go, “Well, yeah. You could do the whole bloody thing on stage,” which we probably could but I think that would be far too much for the tour. We’re going to do four songs from the album. We’re going to do the title track and three others which should be enough just to give people a flavour, and just to let other people know that don’t know that the album is actually out. I think four would be enough. You can’t do too many. They like the new stuff but they’re coming for a good night out with the mates, and they want to hear the songs that they remember us playing over the years, so that’s what we try and do, and please everybody. “Here’s one you might remember,” and something and then quite old, old ones to bring them back two or three really old ones this tour. People will probably find out when we start the tour. Then we just try and keep as many of the people interested all the way through the night. There’s something for everybody and you can always have another drink if you don’t know one, and sing along to the one that you do know. It starts off with new stuff and then builds up to the old stuff, sort of a crescendo at the end of the gig. Hopefully, then you’ve got everybody dancing and rocking and rolling, and promoters will see that and welcome us back that would be nice. Let’s hope for the best because we want to keep coming back and playing in N. Ireland and play other countries and we don’t do much in Ireland. It’s a real shame, so we are there as often as we can. You can’t go the other way and be there every week, then nobody will come to see you. There’s a fine balance. I don’t know, we’ll just see. ANTIHERO: I’ve subsequently relocated in recent years, so I’ll be popping along to see you in Manchester. I just wondered, talking about that touring, set lists, the more the band moves on, the more albums you’ve been doing. How do you develop, create a set list? I mean, that must become an absolute nightmare. ANTIHERO: Outside Magnum and in your solo music career, your solo albums, you have usually also involved Tony as well? I’m just thinking, you must be like family, the relationship between you, rather than just musical partners these days. Bob Catley: Oh yeah, we get along great we’ve been working together for over 40 years now. Yeah, 46 years, almost going. We get on really good and we think the same things usually. We don’t argue, there’s nothing to argue about. We like the same stuff. We’ve always been friends and we’ve only grown stronger as the years have gone by. He’s a great bloke, I’m really proud of him. He’s a very good producer, and he knows exactly what I can sing best and what isn’t good for me to sing. He doesn’t make me do stuff that I don’t want to do. There are other times where kind of go, “Oh yeah, I get it now. I’ve got to get this song, and I’ve got to get this direction. Then away we go, and we have a mutual understanding between us. It’s great working relationship and I’m really happy that we’ve been working together all this time. I see no reason that we can’t carry on working together for many years into the future. We’re both just keeping going until we drop down dead, I suppose rock and roll ultimate endings, dropping dead on stage. That’s awful. I’ve been rehearsing all day so my brain’s fried. ANTIHERO: How do you explain the fact that Magnum is still around in 2018? How do you define your enduring popularity? Bob Catley: We’re more popular now than we’ve been in a long time. We’ve got 20 albums now, we have a musical legacy. The fans keep coming back to see us. We get granddads and grandmothers and fathers, and mothers and children, daughters and sons, we get three generations of people coming to see Magnum now. It’s incredible to know that is wonderful singing the songs, and it’s a very nice, lovely atmosphere. There is a lot of love for the music and the people in the band, I think. It’s nice that we have that connection with the audience and the feedback is incredible. I sing to people personally, I think. I don’t just sing I try to involve everybody that I can make contact with and involve them in the singing the music, in the songs. I think they appreciate that. Our audience, they might as well be on the stage with us a part of the band, because we can’t do it without them. You need that feedback, you need that input from the audience. They go crazy, they go nuts. We probably go see countries a lot of times, and that we get the same time reaction the love of the band and the music is wonderful. It’s a great place to be, on the stage with the people that love you. I think that’s what’s kept us going. I think that’s why we’re still there. If we hadn’t have had that level of support I think we would probably have split up years ago. The people keep you going, then they keep coming back. They latch onto the band and stay with you. I think they love you for the rest of their lives. It’s like Iron Maiden, they’ve had a big resurgence of interest in their music and their live tours, and good for them. I’m using them as an example of their level of popularity, even more. We’ve started to do that ourselves, and it’s lovely. ANTIHERO: I think that’s definitely true. I’m talking from personal experience. There always was that connection with Magnum and their fans. Going back to what you said about those early gigs, and every year you came and toured Belfast, you always made time. I do remember one particular occasion, bringing myself and a few friends into the soundcheck. Taking that time with your fans, I think that was always true of Magnum. Bob Catley: Yeah. Yeah. Fans like to come and do the soundcheck, and if there’s not too many then we can do that. You can’t do it for everybody because you want to hang onto the surprise of the show. Yeah, there are certain people who contact us and we have a chat with them afterward see if they want to have your picture took with them. We like to do that really, just to just meet some people and actually treat them with respect. They’ve come a long way to see us, spent a lot of money [ for the show and the records, merchandise, and other things. We always will come out before the show or afterward even. Last time in Belfast we came out from Limelight for the last time two years ago, we were there ages and having our picture taken, talking to people. We had the buses parked outside. It was great. It was a really nice, lovely feeling to think that people want to hang around that long after the show because we don’t come out right away. We need to get changed and eat and have a drink or whatever. Maybe an hour after you’ve finished you come out and the street’s full of people. can I have a picture with you? Sign etc… I think you need that, we cannot just come out and ignore them. I can’t do that. It’s not in my nature and it’s always the same with the rest of the band. We just try to be good people, be a good person. I think that’s how it is in life, is to be yourself and be nice to one another, and treat people like you’d want to be treated. ANTIHERO: Apart from the latest album, which every band is obviously going to say, “That one is my favourite,” looking back at your musical legacy, would you be able to single out a particular favourite album? Bob Catley: I love older albums mostly. I’ve lived with and enjoyed the Storytellers album for a long time. The songs on there just speak for themselves. “Les Morts Dansants”, “How Far Jerusalem”, “On A Storyteller’s Night”. Yeah, but then as you go through the albums, another one comes along. As you say, the bands will always say, “I like this album, it’s my favourite,” because it’s the freshest in your mind and you’ve just finished recording it. The songs are still fresh and new in your head. I’m not surprised that people say that. I say it myself. “Oh yeah, the latest one. Thinking about it, the latest one of course plus Storyteller’s Night for me. The reason I love it, I love the artwork, I love the way the cover image comes across. The production isn’t particularly great. Production techniques have come a long way since then. Tony’s a lot better producer than what we used to use. We spent a lot of money to use big money producers, but nowadays the technology’s moved so much and you can make it sound fantastic just by doing it yourself. Tony knows exactly what he wants the band to sound like and the songs to sound like. We go anywhere else? He’s just as good as anybody that’s huge, probably better, I would say. Plus, given the new technology these days the production level is 5,000% greater. The sound, the meaning of the songs, and the words. I need certain lyrics that I can personally connect to and mean something to me, and the audience loves and can relate to. That’s another reason Storytellers is my favourite album. Apart from this new one, of course, which I and I think everybody’s played brilliantly, especially the two new guys they contribute so much to the band with their great playing, very interesting. ANTIHERO: I was going to ask you about the new guys, Bob. Mark Stanway, his departure from the fan perspective, it seemed a bit sudden. Bob Catley: Yeah. he’s nuts, what can I say? That was his choice, his choice alone. He’s obviously had enough of his own reasons. We used samples on the second night and the third night of the tour, for the keyboards, fortunately, we knew somebody we’ve already said, “Hey look, can you come over and meet us?” He then played the whole show and he did a great job. We came back the next night and he was there on stage with us and leading the show, which he’d never played before. He probably knew some of the songs over the years, but he’d never played with the band -he did a brilliant job and he finished the last two shows of the tour for us. He is very enthusiastic and he’s one of the most accomplished people that I’ve worked with the keyboard you go, “Wow, what a difference He plays the basic elements of the songs and quite progressive parts. Really reminds me of a lot of stuff I’ve heard over the years and you can’t get better than that. Lee Morris is a great drummer. He has taken Harry James’s place. We’re still good friends with Harry, of course, but he’s been taking more and more work with Thunder and he was busy. It just had to happen, I think it was the best for everybody. He’s a great drummer and a great bloke, and he’s so enthusiastic to be in the band. you can hear the difference between previous albums and this one, is you can hear the enthusiastic approach in the playing and the vitality of the new band members we’ve gained so much by having both of these guys in the band. ANTIHERO: You mentioned earlier, this is the band’s 20th studio album. Do you find that it’s become easier or more difficult to write songs as the years move on? 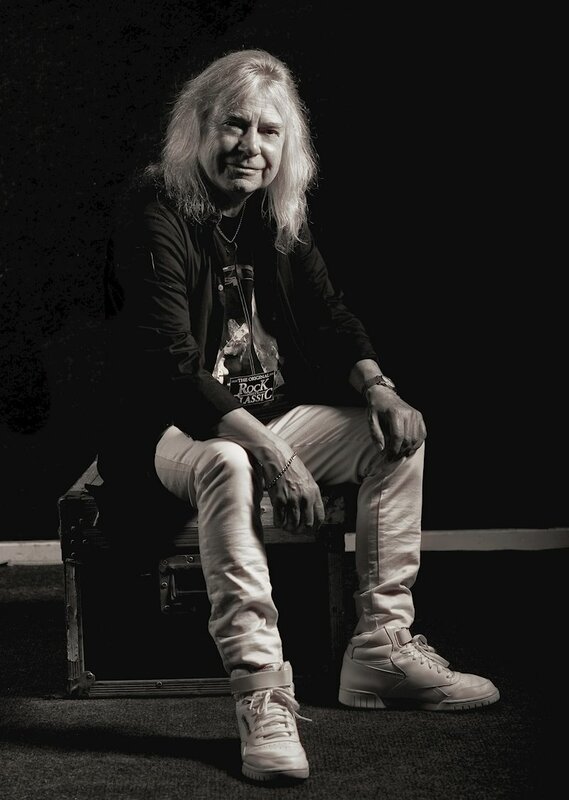 Bob Catley: I think Tony is an incredible songwriter, and I think it becomes harder, because for him, he’s up against the success and the popularity of the last album and all the songs on that album, and now he’s got to do it again but exceed the expectation. The expectation is not just to do the same again. “No, we just did that album last time, thank you.” You’ve got to achieve this success of the last album. The popularity of his songwriting back catalogue has created a rod for his own back. “Oh, crikey, I’ve got to do this.” It can’t be worse, it can’t be just it has to be better. How many times can you make things better? Last time you’ve got to do the best thing you’ve ever done, and the next time you go, “Well, this is actually better.” That’s the hard job for Tony. He’s quite an intelligent guy and he makes his observations based on the news or what’s going on in the world or relationships that over people are having or whatever. It could be quite an ordinary happening but he ties it in with fantasy and stuff like that. Some of the songs you can read more than one meaning in them, so they’re quite ambiguous. He likes to not really explain everything about what the song’s about. It’s like, “What do you think it’s about?” and let them conjure up ideas and images in their heads and then going, “This is about going to the pub.” It’s something like that, yeah. Well, I think we’ve had ups and downs over the years, but I think we’ve made consistently interesting albums, I believe. We’ve toured most places, I think, done big gigs, little gigs. I think Tony’s written songs that mean something that I think people will remember for a long time, hopefully, that the words, the lyrics meant something to people. People were glad to listen to a Magnum album late at night by the fire, on their headphones, or with their friends or whatever, because that’s what I’ve heard they were playing Magnum on. I think that’s our legacy, as classy, you know, rock, relevant music, either 40 years ago or tomorrow evening, or Friday when the album comes out, you know, anytime. I think the albums, the songs are timeless. Some of the songs from the first couple of albums could have been redone and put out in much later years, recent years, and would have meant just as much as they did then. The lyrics are the lyrics, and people, the world didn’t change that much in 40 years, politically or other examples. I can’t think of any more. There’s always a message of hope within Tony’s songs, at least, you know, “It’s okay. You might not be great today but you’re going to be good tomorrow.” He’s written a lot of those songs. So, it’s got a good heart and I think people can appreciate that. People played the songs to their kids, and their kids grow up and they play the songs to their children, and so the music can be … It has a lot of longevity and it can be eternally popular. As long as you keep passing it down the generations it will never die. It’ll always be there. I think that’s important and that’s our legacy, it’s good stuff and it’ll give you a smile. Come and see the band and people enjoy the gig and they come back and see you. If people keep coming back and seeing you time and time again every time you go out on tour with a new album coming out, then that’s a great legacy at our age, yeah. After 40 years and 20 albums, I think we’ve done something right over the years. ANTIHERO: Do you enjoy it? You seem to still enjoy it. That’s the main thing. Bob Catley: Yeah, absolutely. Yeah. I mean, what else am I going to do in life? It’s what I do. I’m very lucky. I’ve been blessed, and I’ve got one of the best songwriters, producers, guitarists in the world as far as I’m concerned. I’ve worked with many other people, as people know. I’ve done solo stuff over the years. But, Tony’s is way the best I’ve ever worked with, you know? That’s no insult to everybody I’ve ever worked with, but Tony’s the best and I love it, and we love going out on tour. I love being on the bus and all the shenanigans that go on the bus, and traveling around countries and Europe, and meeting people and shabby hotels, and rock and roll. You know, it’s what you do. It’s not part of what you do, it is what you do. It’s a vocation in life. It’s not a job. This is great fun. I love being in the studio and watching Tony create music from just ideas to a full-blown epic, like on this album. I love being a part of that and singing the words, and getting through the songs, and then taking it out on tour. It’s great. What else are you going to do? It’s just a great life and I still love doing it and I always will. As long as I’ve got my voice and my voice is wanted, the music is still wanted and relevant, and we can still tour and record and do all the things that we have to do, then why shouldn’t we carry on doing it? And I love doing that as well, and it came from being the same old Magnum. We happen to be … We’ll still be Magnum. Because, Tony’s worked with some of his heroes on stage, from his past, and he loves Magnum to bits and I think, and that he tells me. And he was very happy to have me and I’m still doing it now, being in the band with him and the other guys. It’s a wonderful show and I hope it happens again in the future. I never know if it’s ever going to happen again, but I hope it does. I think if I can do it at a high level from a performance point of view then I will certainly be doing it more in the future. That comes from within, it’s surprising all of us. ANTIHERO: You have been blessed vocally. A lot of singers of your generation, when you go and see them live now they’re not quite as good as they used to be. But to be fair, I mean, your voice has, it’s endured. I mean, it’s as good as ever. Bob Catley: Thank you very much. Bob Catley: Well, yes, I mean, I just … I’ve been lucky with my voice and it’s been good. I don’t know. I try and not be hard on myself these days, more than I used to, because I need my voice. It’s my job, my living, and everything. I couldn’t do that without my voice. I’ve tried to improve it over the years as much as I can and not just stay at the same level. Because there’s a lot of competition out there and I know I’m in competition with the best singers in the world, rock-wise I mean. That’s what I’m looking at. So, you’ve got to keep on it. You can’t just go and say, “Oh, I’m brilliant,” you know? Because you won’t improve, and you won’t progress. You have to keep on it and then keep oiling the larynx and trying, just keep singing. The more you sing, the better you can sing. It’s that experience and doing it and doing it again, and doing it properly and doing it right, and having the right attitude. Taking the highs and the lows and whatever life’s going to throw at you, and just keep doing it and I think you will improve. That goes for a guitar player, a drummer, singer, anybody. You just keep doing it and doing it with heart and mean what you say. Just be truthful and honest. Yeah, I like my voice and I think it’s as good as it ever been. It’s matured. The older I get I think my voice becomes better, and manlier and more mature. I think people like that, you know? No, I’m not 40 anymore, as you know, so I think … When I look back I never thought I would be at this level of singing and at this level in my life. So, I think my voice is okay. ANTIHERO: Did you ever think of writing a book? Bob Catley: No. I can’t be doing that now. Bob Catley: Well, no, because I can’t. I can relate and share by writing a song. It’s just not for me. I sing, I sing, I sing, and that is way enough for me. I’m not going to write a book. I wouldn’t know what to put down, and you know, you use a ghostwriter and all that. I know everybody else does it, but I’m not interested. I’m not interested. Music is enough. Yes. I have considered it in the past but moved beyond that now. ANTIHERO: You must have some great stories. Bob Catley: Yes. Yeah, I’m sure we have a lot of stories, and we tell them to people when we meet up with them, you know? We do interviews like we’re doing now, and people on the road and friends, we tell stories and stuff. Tony can’t be asked to put it into words in a book. I know that other people do, but that’s up to them. I’m sure a lot of people would love to read the details, the nitty-gritty of what went on out there, but it’s not in us, really. ANTIHERO: I’m already way over time and appreciate you talking to me. Bob Catley: Thank you for your time and the nice questions and I hope people enjoy what we’ve been speaking about. ANTIHERO: I hope so, too, Bob. Hopefully, we’ll get the opportunity to say hello personally when I go to see you in Manchester. Bob Catley: Yes, okay. That would be nice. Yes, we can do that.